Welcome to the Famulus Business Hotel****! 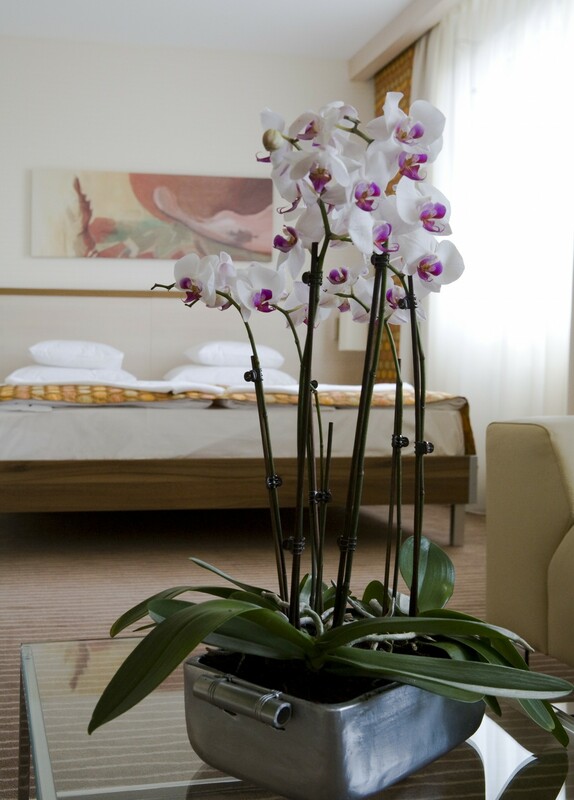 Thank you for choosing our hotel for your stay in Győr. We hope you will have a pleasant stay. We would like to help you with some additional informations. If you have any further requests or questions, we are here to help you. 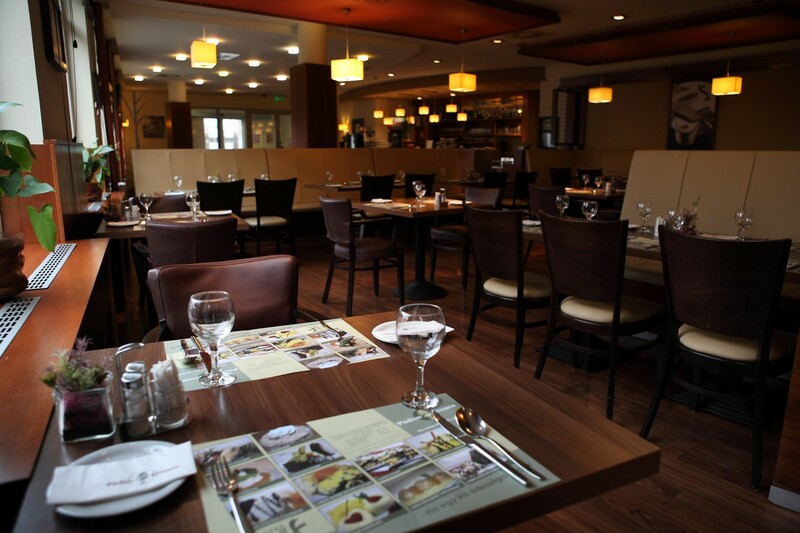 In the name of the staff I wish you a very enjoyable stay in Győr, in Famulus Business Hotel****. 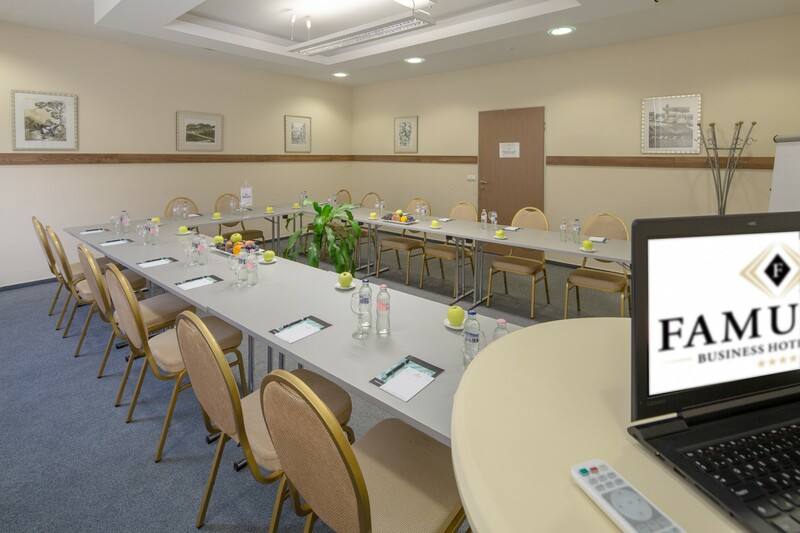 Famulus Business Hotel**** -one of the biggest hotels in Győr and surroundings offering a complex and high-quality services the whole of the year- welcomes you. 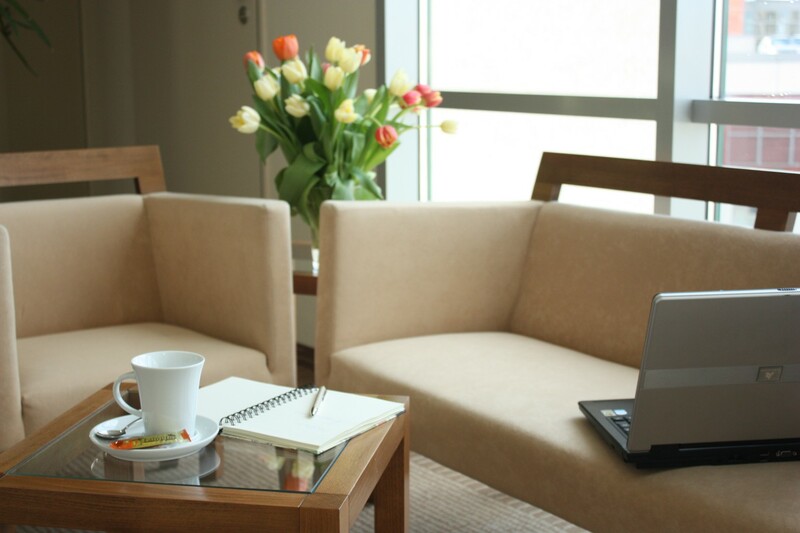 There are 118 spaces – single, double rooms and a suite - in the hotel at the guests’ disposal. The rooms are equipped with bathroom,Tv, Minibar, Internet-access, air-conditioning, hair drier and telephone. The hotel disposes one of the most modern technical backgrounds. 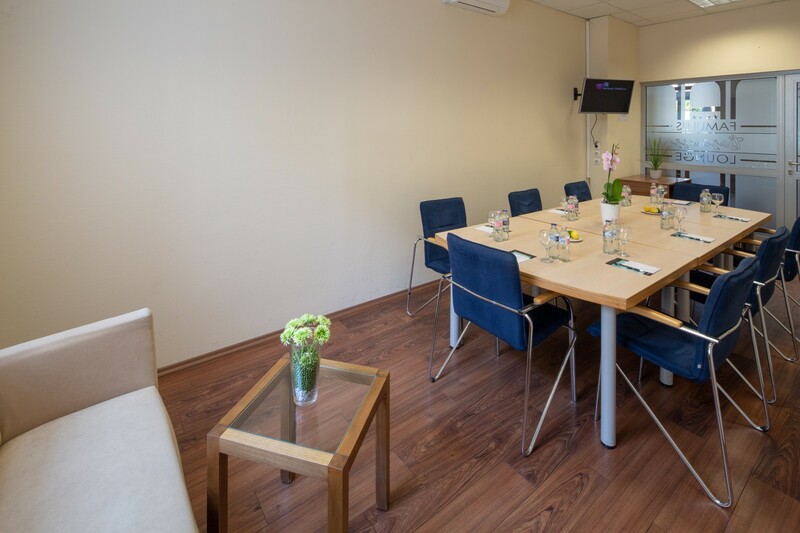 The conference rooms with different sizes (up to 180 / 40 / 20 people) enable the organisation of events with incomparable conceptions. In the Podium Restaurant you can find beside the local and international specialities vegetarian and dietetic dishes as well. For the pleasures of the table our first-rate cooks are responsible. The recreation services in the hotel are the following: infrasauna, massage, squash court, fitness room and bowling club. There is a possibility for renting bikes. Our guests arriving by car can park their car in our parking area free of charge. There are four rooms in the hotel, which are equipped for our disabled guests. The hotel is totally accessible. The hotel is totally air-conditioned. Please check the information before using it in the rooms. Alarm can be asked at the reception of the hotel. There are some ATMs near the hotel,and in Árkád Shopping Centre, 100 meters from the entrance. Bath-gown and slipper can be required at the reception. The following bathroom products are available at the reception: shaving set, toothpaste, shampoo, manicure set. Please turn to the reception. In case you need a daily change of the bed-clothes, please turn to the reception. Bicycles can be rented. Detailed information and map can be required at the reception. The Famulus Bowling Club can be found in the basement of our hotel. 2 lanes are available for our guests for extra money. The opening hours are according to demands. 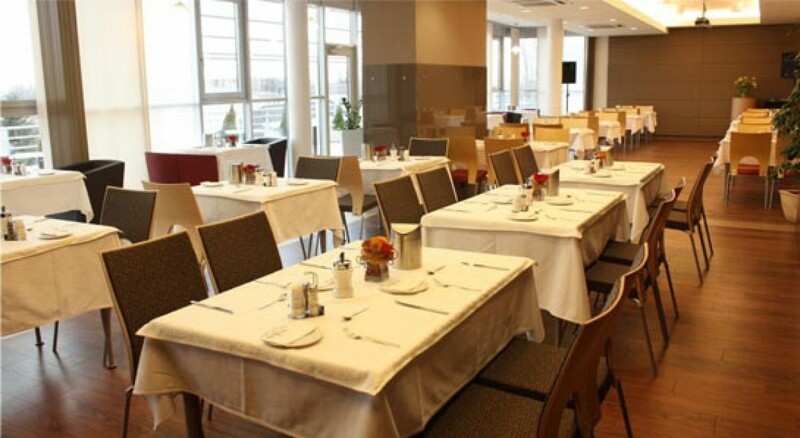 You can have breakfast between 6:30-10:00 in Restaurant Panorama on the IVth floor. In case you would like to have breakfast in your room, then please turn to the restaurant or to the reception. Room-breakfast fee: 500 HUF. Different phone chargers are available at the reception for security deposit. Daily cleaning is done between 7:00-15:00. In case you want the cleaning at other time on that day or you do not want cleaning at all, please put the card on the handle of your door. In case you need extra cleaning, please turn to the reception. Six conference halls are available to the guests. Our hotel accepts the following credit cards: American Express, Eurocard / Mastercard, Visa. We ask you to leave the room till 11.00 o’clock on the day of your departure. In case you plan to stay longer, please turn to the reception. The electricity is 220V/50Hz. In the bathroom we have power-source appropriate only for using razor; in case of using any other appliances please use the plugs in the room. Please read the information posted on the door of your room. In case of emergency please call the reception. In case of noticing smoke or fire, please call the reception. In case of fire-alarm, do not use the lift and leave the building immediately. You can open the doors at the end of the corridor with the key found on the wall and in case of fire please use the outer stair-case. The fitness room of the hotel can be found in the courtyard. Each room is equipped with hair-drier. We can also provide hair-drier. If you need technical assistance, please turn to the reception. There is kettle with coffee and tea making facilities in the room. 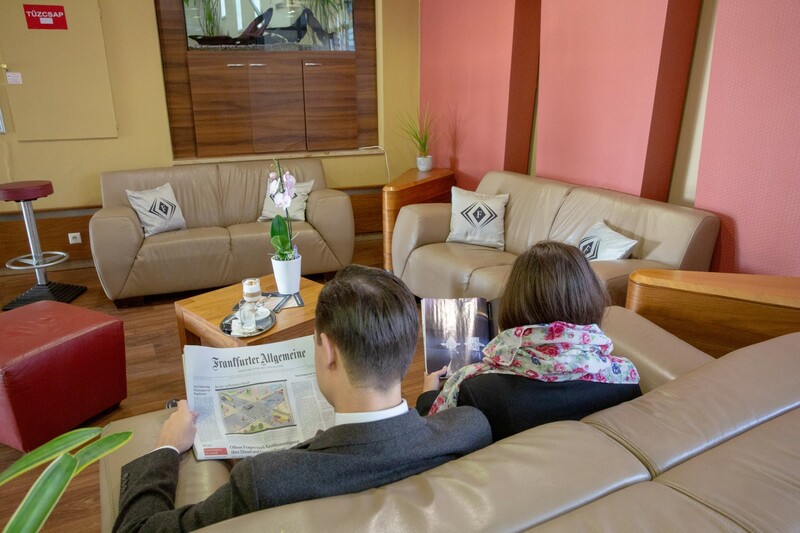 The lobby bar at the reception is available for the guests 24 hours a day. We keep the forgotten items here for a moth. Free information maps can be found at the reception. Traditional Thai Massage is available in our hotel. For further information please turn to the reception. For further information please turn to the reception. The price of the consumed products will be included in the invoice. It is forbidden to take pets into any parts of the hotel. The playing room next to the reception is available for children all day. 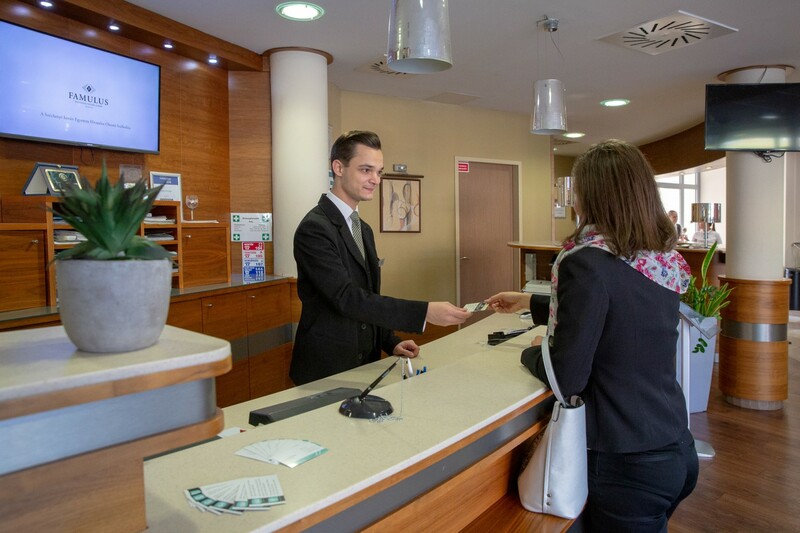 It is possible to get information and tickets for concerts, theatre, ballet, cinema, sight-seeing and other programmes via the reception of the hotel. For further information please turn to the reception. The official public holidays of Hungary: 1 January, 15 March, Friday before Easter, Easter Monday, 1 May, Whit Monday, 20 August, 23 October, Christmas (25. 26. December). Open: Monday – Sunday 11.00 – 22.00. From Monday to Sunday between 6.30–21.00. There is a safe in each room. You can use the central safe at the reception for free of charge. We take no responsibility for possessions deposed outside the safe. Sewing-set can be found in the wardrobe of your room. For further information please turn to the reception. There are shoe-cleaning kerchiefs in the hotel rooms and a shoe-cleaning machine in the hall of the hotel. The two squash-fields of the hotel can be used by our guests for extra money. For further information please turn to the reception. Smoking is forbidden in the hotel area. Taxi can be ordered at the reception of the hotel. In case you observe any technical problems in your room, please inform the reception about it. In your room you have direct line to make phone calls in Hungary or abroad. Please check the instruction manual. The fee of the call will be charged on the bill of your room at the reception. You can choose from Hungarian and foreign TV channels. Please have a look at the information on the TV. Umbrella can be rent for security deposit at the reception. If you leave your clothes to be washed and ironed till 9.00 in the morning, we do the cleaning that day. The hotel takes no responsibility if the clothes loose their colour or change their forms. Washing-bag and price-list can be found in the wardrobe. Please mark the number of pieces on the list. Otherwise the data of the hotel should be accepted. Closed on Saturday, Sunday and on public holidays. 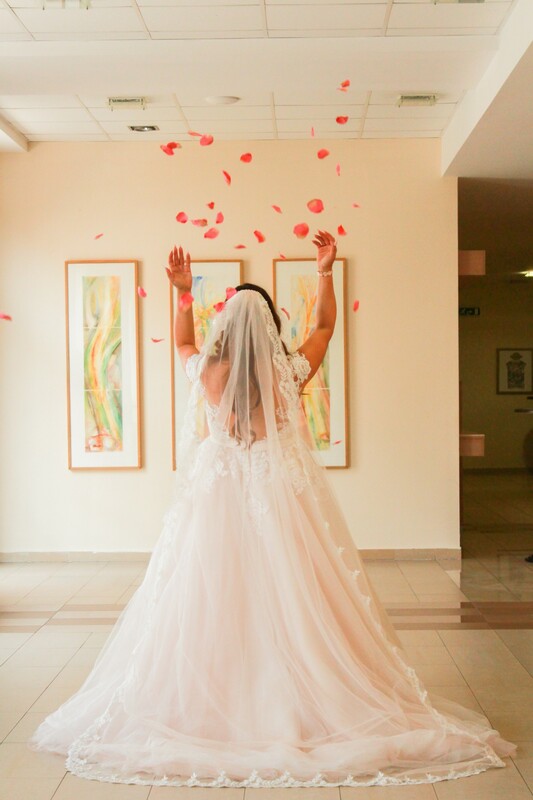 Ironing-board and iron can be required at the reception. We take no responsibility for any objects not placed in the safe at the reception. Safes may be used free of charge. If you enter the wrong code there are three signal-tones and the yellow LED flashes. Now you have two more attempts to enter the correct code. If you enter the code 3 times wrong the lock blocks for 20 seconds. During the locking-device-time the lock doesn’t react to any entry. While the machine is chilling, a snowflake appears on the display. The adjusted temperature will be shown on the display. Switching "mode" button you can choose between heating and chilling. After switching off the air-conditioner you can hear a „bip” voice and it will stop automatically. The prices include the buffet breakfast, but do not include the city tax: 450 HUF / person / night (above 18 years). The prices are valid till the 31st December 2018.